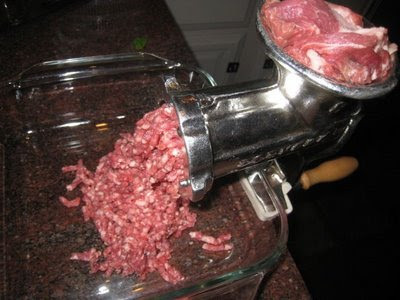 I always wanted to try grinding my own beef for my hamburgers. I had read how to do it and finally got around to it. It was quite satisfying to understand how the process works and what the benefits are. I started off by getting a meat grinder - a hand crank model by Porkert from the Czech Republic. (A good friend of mine who happens to be Czech claims that everything great in civilization came from the Czechs: robots, revolvers, beer and now awesome meat grinders.) My Porkert cost me $46.95 at Sur le Table. 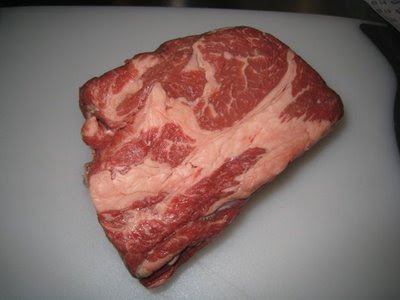 A trip to Schaubs at the local Stanford mall garnered two pounds of boneless chuck roast ($9). I asked the butcher if the beef had the requisite 20 percent fat. He didn’t know. He said their ground beef had 20 percent, but that was because they added the right amount of fat. Not to be deterred, I took it anyway, fat percent be damned. By the way, Schaubs has a local delicacy called Fred’s Steak. It is a marinated tri-tip that is about as good as any meat you will taste. Once home, I washed the Porkert (love that name) to remove the any residual oils from the manufacturer. It was easy to assemble. I inserted the quarter inch grind plate. I clamped it to my wife’s breadboard, much to her chagrin, to started grinding. Next I added salt and fresh ground pepper to the mix. I formed it into 4 half-pound patties. I noticed the beef seemed airy and light compared to the ground beef I usually get. I cooked the patties on my Weber Summit gas grill for about 5 minutes per side on 400 degrees. I like to rotate the patty 90 degrees on each side to get cross pattern from the grill bars. But you only turn the patties once, to lock in the juices. Also, don’t smash them down and force out the juices. A minute before taking them off I melted a slice of Gruyere cheese on the patty. 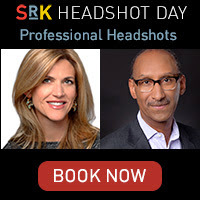 I had mine on a fresh bun. Pat had hers on a bed of greens. I also added my favorite HoosierBurgerBoy sauce to mine. The burger was very tasty. It was a little drier than I expected. Next time I will cook it a little less and try to add a little more fat. But overall it a lighter and fresher than other hamburger I had bought. 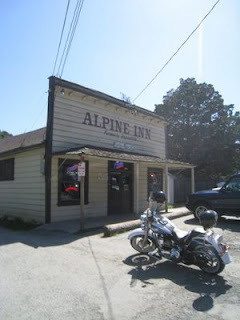 The Alpine Inn in Portola Valley is usually referred by locals as Zott's. The sign out front says The Alpine Inn formerly Rissotti’s. Whatever you call it, locals of all types enjoy eating there. In the fenced area outside on a recent sunny Sunday in March, it was filled with every type of person of every age. There were Harley riding bikers, a kid’s rugby team, hikers and bicyclists taking a break from rides through the green hills of spring. The line was long inside the cozy old main room that houses the bar and the grill. Vintage beer posters hung on the ceiling. A bikini clad girl holding a Stroh’s. St. Pauli girl before she was redrawn with huge breasts. There were deer heads with hats hanging on the antlers. The line to order was long. The 15 minutes went fast as I spoke with my new friends in line. Everyone at Zott's seemed to be in a good mood. After ordering, I grabbed a newspaper from the community pile of papers and books that was stacked on a picnic table. My name was called within a couple of minutes. 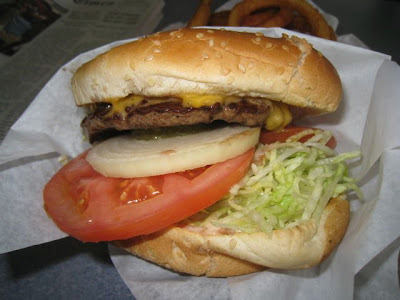 I retrieved my double-cheeseburger ($7.25) with grilled onions (30 cents) and small fries ($2.75). 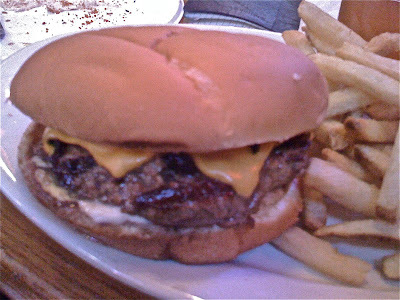 The burger was prepared from a stack of rectangular beef patties separated by paper stacked next to the grill. Small chunks of sweet grilled onion and American Cheese melted together on top of the patties. They sat on a crunchy roll that had been toasted. Fresh lettuce and tomato finished of the combo. It was a fabulous mess that satisfied my hunger after riding my bike the six miles to the restaurant. The fries were old style crinkle fries that were lightly coated. They were crisp, but only warm. I didn’t really find them to my taste. But I usually don’t enjoy coated fries. I enjoyed the sunny afternoon sitting at the picnic table next to the creek full of playing kids. 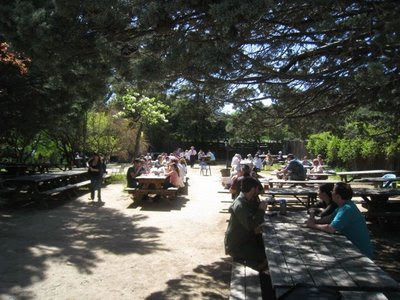 Zott's is a great place for a burger on a sunny afternoon in Northern California. Best-O-Burger in San Francisco is a unique way to get your burger. The choices are few. The burgers are slider-small. 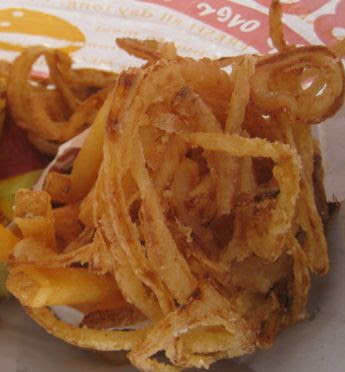 The onion strings and fries that come with your burger are crunchy and flavorful. The experience is inexpensive and fresh. Have a bag and chow down. I walked over from the Sutter Street garage, working up a good appetite. As I rounded the corner from Kearney onto Pine I almost missed the small unassuming burger stand. Tucked in a little from the corner in an unassuming place, yellow and red colors dominate the place, like MacDonald's or In-N-0ut. What's up with yellow and red? I ordered a 2 Cheese Bag ($3.78), strings and rings ($1.79) and a soda. The whole tab of $7.99 with tax is very reasonable. There are no tables in the tiny store. I stood and watched as my burgers were fried up in an iron skillet. Trays of fresh buns sat above the counter. In no time, I had my bag and headed across the street to sit on a bench and eat. 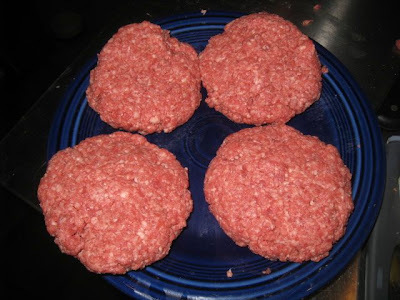 The burgers are small, probably 6 to a pound of beef. They are a gourmet take on the White Castle slider, but ten times better tasting. 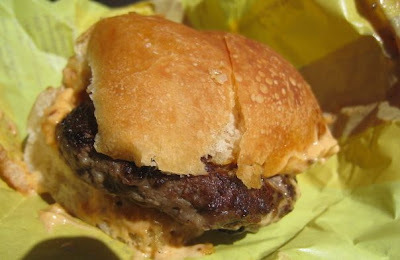 Each burger had a small slice of cheese and a nicely tangy sauce, sort of like thousand island. Slightly pink beef sat inside a soft and springy bun that held up well in all the juice. The potato strings were crisp and slightly sweet, almost like someone had slipped sweet potato flavoring in. They were thin with skins on the end and stayed crunchy and tasty even as they got cold. The rings were really onion strings. They were equally tasty. Treat yourself before word gets out. I think Best-O-Burger will be a big hit. Meatpaper struck a chord me with me. I tried be a vegetarian earlier in life. I made it 18 months before the lure of the hamburger became too strong. Meatpaper explores and exposes that conflict. Visit meatpaper on line at www.meatpaper.com. 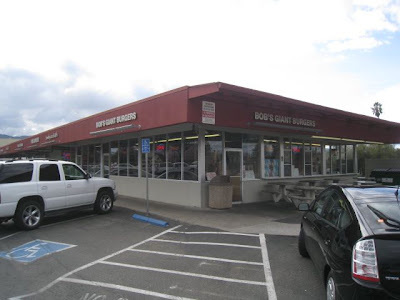 Bob's Giant Hamburgers in Pleasanton, CA is an old school burger stand set on a corner near downtown. I was there at 3 in the afternoon one Friday and was the only burger guy. A steady stream of soft-serve ice cream customers kept them busy. As I sat in the clean dining room, I noted how blue it all was. Blue tables. Blue floor. Photos of old cars that covered the walls. They had faded to blue as old color photos are inclined to do. The cheeseburger ($4.55), fries ($1.85) and onion rings ($2.75) were all hot and served up fast. 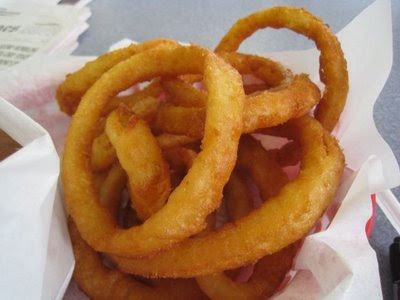 The onion rings were my favorite. They were battered and thin. Crispy and tasty and unique without any old grease taste I often get in these kinds of places. The fries were hot, salty, medium-think, skins-free and served in a big white paper bag. The burger itself was a thin patty served pink and hot. There was ample shredded lettuce, an onion slice, tomato slice and American cheese melted on top. The thousand-island-style sauce was thinly applied to the toasted sesame bun and lost in the pile of vegetables. It was a pretty good classic-style burger. As I was leaving, I got a chocolate shake ($3.40) for the road. It was interesting seeing it prepared on the "Electrofreeze" machines. First syrup and milk were poured into a Styrofoam cup. It was topped off with chocolate soft-serve. The cup was inserted under a mechanical stirrer that mixed the whole concoction. After all that, it tasted like chocolate soft-serve. I think I prefer the Hamilton Beach method with scoops of ice cream. Marqs in Menlo Park, CA was a total surprise. We had heard it was opened by the former bartender at Oak City, which is a good bar. 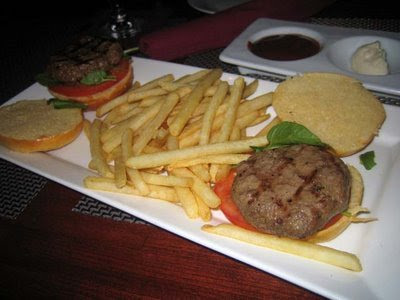 We headed in and what to our wondering eyes should appear but Kobe Slider's Duet ($12)? This was so unexpected that I had not brought my notebook or camera. Fortunately, Pat had her camera and the photo attached resulted. Marq's sliders were excellent. Hot, juicy, petite. The accompanying fresh cut fries were enticingly thin, hot and salty. The lobster spring rolls ($9) and wild mushrooms on toasted brioche ($10) were equally enjoyable. As soon as Marq gets his full liquor license, I can see some sliders and Tanqueray Martini's in my future. 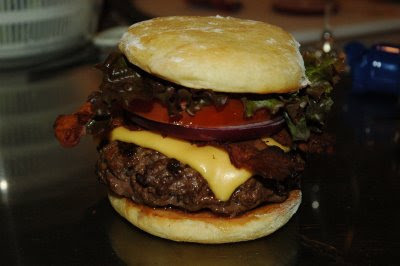 Burgertory - Another great burger blog. Burgatory.wordpress.com is a great burger blog. East coast based but a nice mix of burger spots and perspectives. Nick’s English Hut in Bloomington Indiana, is not a bad place despite being in the shadow of the enemy. I flew to Indiana to meet some high school buddies near Indiana University. Having been a Purdue Boilermaker, IU’s bitter, instate rival, I had never spent much time in Bloomington. Nick’s is huge. The original downstairs is a charming and dark with a double row of wood booths and more seating in back. We went upstairs to the newer large upstairs space, which had a little less soul, but more than made up for it with lot’s of big screens to watch the game. We grabbed a table, six stools and several brews. I ordered the 1/3-pound Bacon Cheeseburger with fries ($8.50). The Bleu burger was recommended, but I like to go with a milder cheese so I can taste the beef. I also, ordered onion rings ($3.50 for a half order.) There were lots of other tempting appetizer items on the menu like Breaded Mushrooms and Sink-The-Bismarck Fries ($6.50 with cheese). These are a bucket of fries all spiced up with chili powder and Parmesan cheese and accompanied by a spicy kind of thousand-island type dressing. I highly recommend these over the regular fries. They are unique and very tasty. They go great with beer. The onion rings came with the Bismarcks and mushrooms. They were battered and large and pretty good, although not that unique. The mushrooms were more interesting. They were a very large chunk of portobello, battered and hot, but crunchy on the outside. The burger came and looked very nice sitting on a fresh white Kaiser bun. The American cheese was melted enticingly and covered with bits of bacon that were crunchy and salty. A nice touch I had not had before. I had mustard and mayo on the sandwich as well. Biting in, I found the whole thing very pleasing. It was a bit smokier than I like, but the beef was juicy and cooked a nice medium. I had a bite of the bleu burger and didn’t think it was quite as good with too much bleu cheese for my taste. But the real treat of the evening was the breaded tenderloin sandwich. (See photo below.) This is an Indiana favorite. 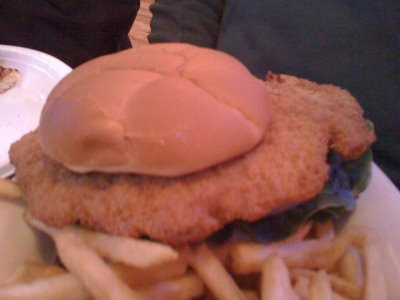 A pork tenderloin is pounded thin and then breaded and deep-fried. 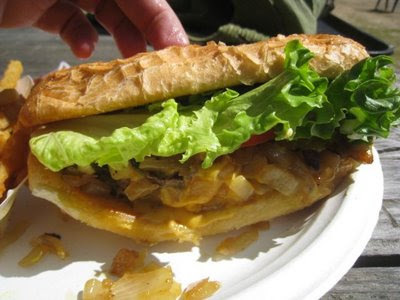 A perfect version is much larger than the bun and this one was very, very good with fresh lettuce and onions too. Don’t miss this treat if you go to Nick’s. Another great meal I had in Bloomington was breakfast at the Runcible Spoon. They have a unique version of Eggs Benedict, but the real find is the superb corned beef hash. This hash mixed mashed potatoes and corned beef fried up in a skillet. Put a runny egg over it and you are half way to heaven. Have the burger at Nick’s in the afternoon and complete the trip. Of course, then you remember you are in IU territory and cannot possibly be in heaven. That is, until IU loses at the buzzer. Then order is restored. 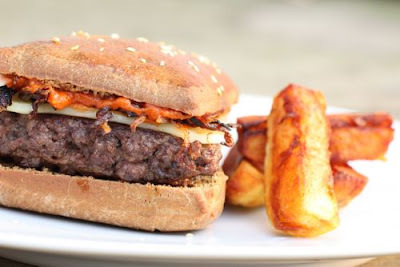 Burger Business is a great site for keeping up with the business side of the burger world. Just to show how up they are on the business, they have Hoosier Burger Boy as a permanent link on their site. 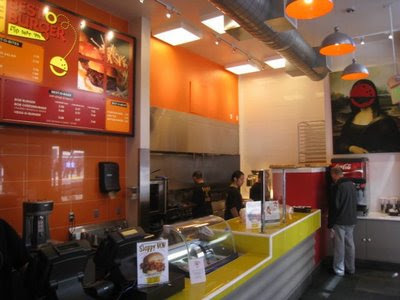 Check out their website at www.burgerbusiness.com. 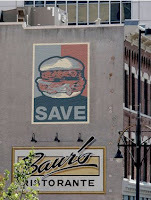 Sure it is just a fun site to promote Good Times Burgers, but SaveTheBurger.org is fun. And really on the right track. It is kind of what HoosierBurgerBoy is trying to do, except without being tied to one restaurant.